Fr. Michael Schmitz is an engaging, inspiring, humorous, and highly sought-after national speaker who has helped thousands of young people hear the gospel message and encounter the love of Jesus Christ. His weekly homilies are featured on iTunes and bulldogCatholic.org, and he has appeared in programs for youth and young adults through Ascension Press. Ordained in 2003, Fr. Schmitz serves as director of youth and young adult ministry for the Diocese of Duluth as well as chaplain of the Newman Center at the University of Minnesota–Duluth. Set out for the future without fear! 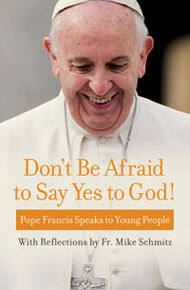 That's the message of Pope Francis to young people as he challenges them to follow Christ and his plan for their lives.This collection of short excerpts of Pope Francis' talks from around the world along with reflections and questions by Fr. Mike Schmitz speaks to the best instincts of young people.